The New Zealand plantation forestry sector, represented by NZFOA, signed the Government Industry Agreement (GIA) Deed with MPI on the 5th November 2015. The signing of the GIA has taken the industry into a new era where the industry and the government are sharing the responsibilities and costs of protecting Radiata pine and other plantation species from invading pests and pathogens. The forestry sector is one of the seven primary industries that have signed the GIA Deed. The GIA offers the industry a formal partnership role with MPI in making joint decisions, at a higher level, across a wider biosecurity system including pre-border and border biosecurity, readiness and response to incursions and pest management. NZFOA and MPI is currently developing an Operational Agreement to provide guidelines to achieve desirable outcomes on improved biosecurity readiness and response. The major incursion of Queensland fruit fly in Auckland in 2015 was the first test case under GIA. The kiwifruit and pip fruit industries were involved in the incursion response. The operation was successful and fruit fly eradication was declared recently. Positive and negative lessons were learned from the process and will be incorporated into the forestry sector Operational Agreement. The Forest Health Surveillance scheme (FHS) has been operating in New Zealand for over five decades and has been credited to be the best system in the world. This scheme was funded by NZFOA members which covers around 66% of the total forest estate. With the introduction of the Forest Growers Levy, FHS will be re-designed and expanded into a national Forest Biosecurity Surveillance system that covers 100% of the forest estate. While the original FHS scheme focused on early detection of exotic organisms in the forest, the new surveillance system is aimed at trade protection using a combination of tools such as entrance pathway analysis, risk maps and survey optimization. The new surveillance system is scheduled to be rolled out from July 2016. New Zealand plantation forest is one of the most productive in the world, partly due to the lack of major forest pests and diseases. Biosecurity at the border and post-border response are crucial to the sustainability and profitability of the forestry industry. The devastation of a single pathogen, the PSA, to the kiwifruit industry since November 2010 highlights the need for constant vigilance. In the 14th Annual FOA/MPI Forest Biosecurity Workshop (23-24 February) entitled “Are we prepared for bio-invaders?” it was concluded that we are heading in the right direction but more biosecurity efforts are needed to ensure a secure and better future for the industry. Dr Wei-Young Wang, PF Olsen Special Projects and Seed Manager, has a background in plant pathology and has been involved in forest health and forest biosecurity in New Zealand since 1996. Dr Wang is currently a member of the NZFOA Forest Biosecurity Committee and its Technical Sub-committee, which is responsible for the FHS Programme and re-design; promotes policies to improve biosecurity; and identifies and provides funding for forest health issues. Figure 1. 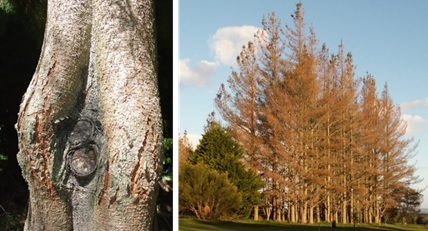 Diseases of Radiata pine caused by pathogens that slip through the border undetected. Left: flute canker caused by Neonectria fuckeliana; right: red needle cast caused by Phytophthora pluvialis. Figure 2. 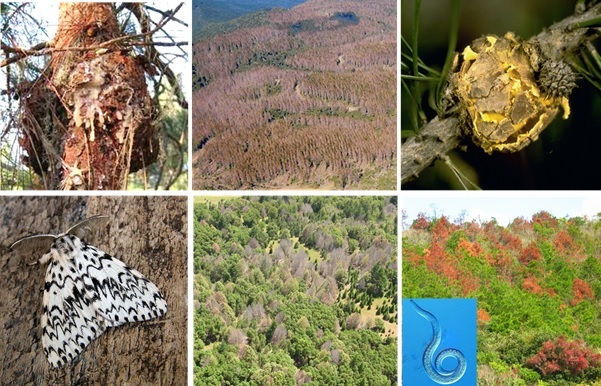 High risk exotic organisms that are not in New Zealand but are prioritized on the forestry GIA pest list. Top left: pine pitch canker caused by Fusarium circinatum; top middle: Dano foliar pini (DFP) in Chile caused by Phytophthora pinifolia; top right: Western gall rust caused by Endocronartium harknesii; bottom left: nun moth (Lymantria monacha); bottom middle: Sudden oak death caused by Phytophthora ramorum; bottom right: pine wood nematode (Bursaphelenchus xylophilus) and the pine wilt disease it caused.